The most important mission for a retail space to pursue is simple: to create a positive experience in order to attract the optimal amount of customers. A happy, satisfied customer is bound to come back. From the moment someone walks in through the front doors they should be immersed in a shopping experience that encourages return visits. As retail is dramatically growing, a focus on customer experience is crucial for a brand’s success. In order to come up with this success, it is important for retailers to look into non-traditional interior elements to display their products. Biophillic design is a practice that stems from the Biophillia Hypothesis which suggests that humans possess an innate tendency to seek connections with nature and other forms of life. In today’s modern “natural habitat” we find that it is largely the built environment. Our natural habitat is where we spend 90% of our time, and with a biophillic design direction in mind we can aim to appeal to our instinctive desire to connect with the natural world amidst a world that in reality is all too often made up of concrete and dark spaces. 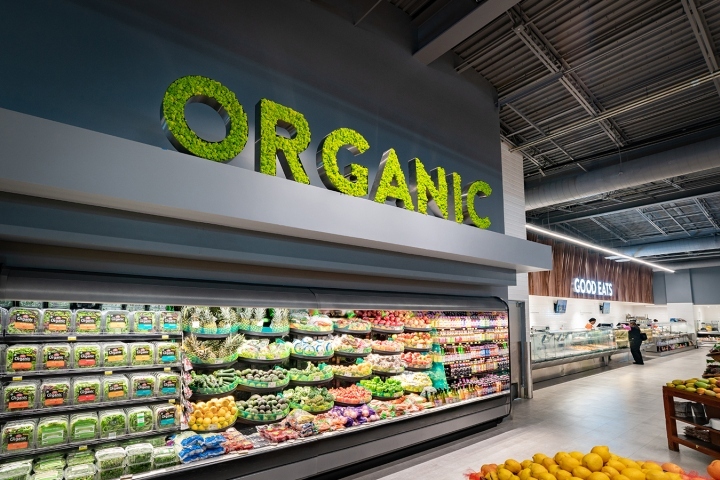 A compelling and effective approach that is becoming more common is to combine experience design with biophillic design in order to create the greatest possible environments for shoppers. When an environment utilizes biophillic design elements it in turns creates a space that empowers it’s customers to sit back, take their time, and shop around. “Retailers have long understood the importance of store environment in enhancing the shopping experience. The outdoor landscape can be a seamless extension of shop interiors, providing indoor/outdoor continuity for a positive shopping experience. Urban forestry can play an important role in business districts. 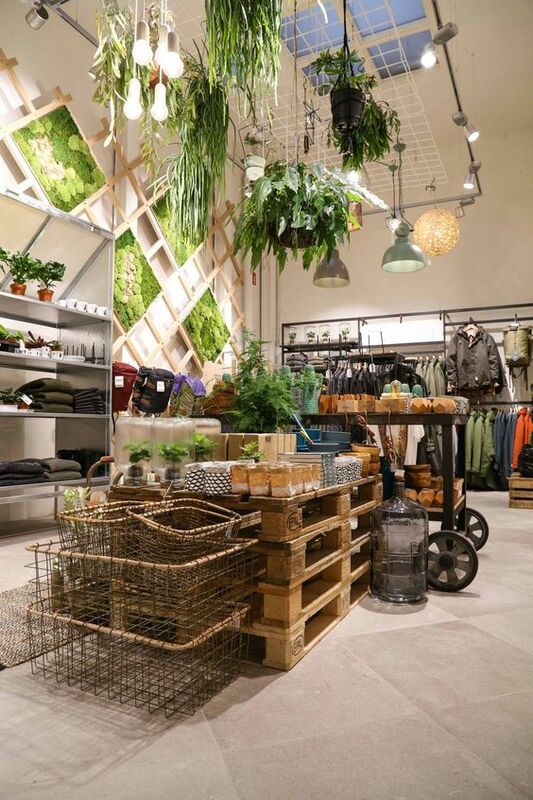 Interior plants and landscape may create store interiors more favorable for retail activity.” (Ref: “Retail and Urban Nature: Creating a Consumer Habitat”, K.L.Wolf, at the People/Plant Symposium, Amsterdam, 2002). 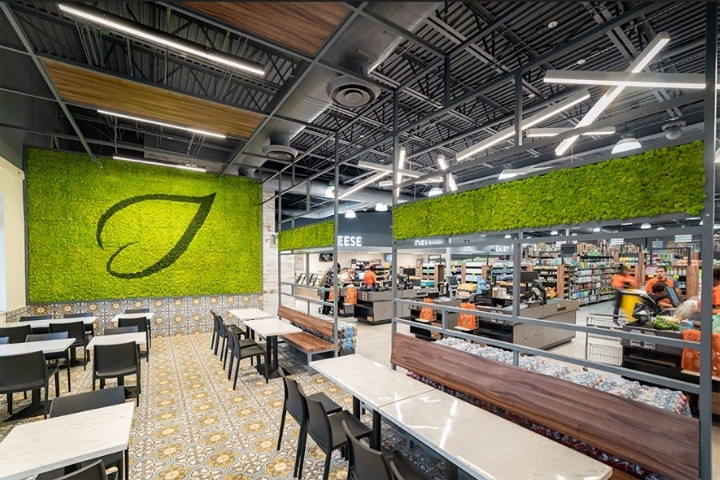 Greenery and organic materials are fast becoming one of the hottest design trends and it’s a perfect fit for retail. 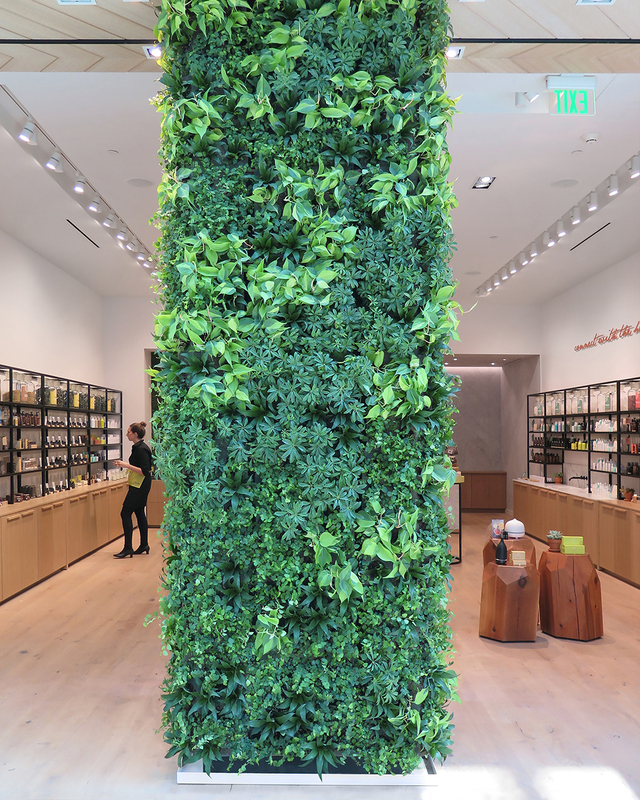 Studies show that greenery enhances the visual quality of a retail environment. It has effects that include higher levels of receptiveness to prices, increased perception of quality and a more positive shopping experience overall. These are all extremely important aspects of what retailers should be aiming to accomplish with developing their store space in order to lead to optimal success and profit. The use of natural living elements in a built retail interior environment does a lot more than just create a space for positive emotions. Believe it or not, biophillia can actually increase the perceived value of products and boost overall sales. When customers shop in a retail space that utilizes biophillic design elements, the emotions they experience will translate into receptiveness to the environment and products around them. We have seen great success of these practices by major brands such as Apple. 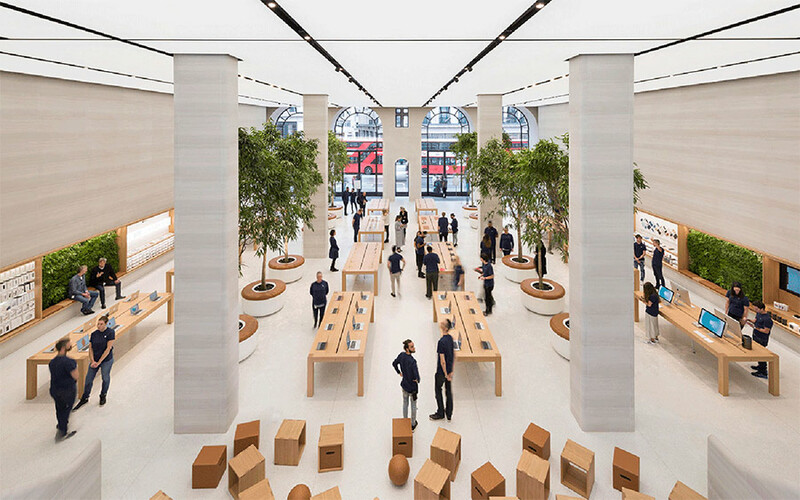 If you can think of your experience visiting or even walking by an Apple store it is most likely quite memorable. 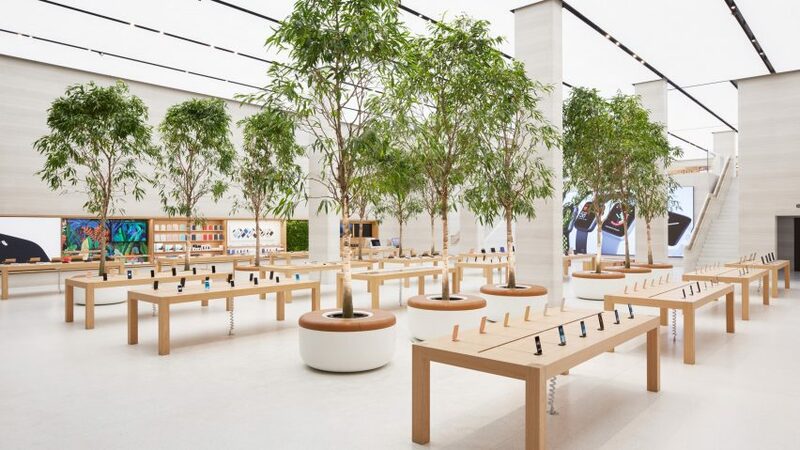 Apple’s implementation of biophillic design elements such as the great deal of natural light and greenery they apply within their interior space has led much of society to connect their unique ambiance to a positive experience unlike majority of other retail store visits. Their success is embedded in the importance they place on the entire experience a customer undergoes from the moment they walk in the front doors. 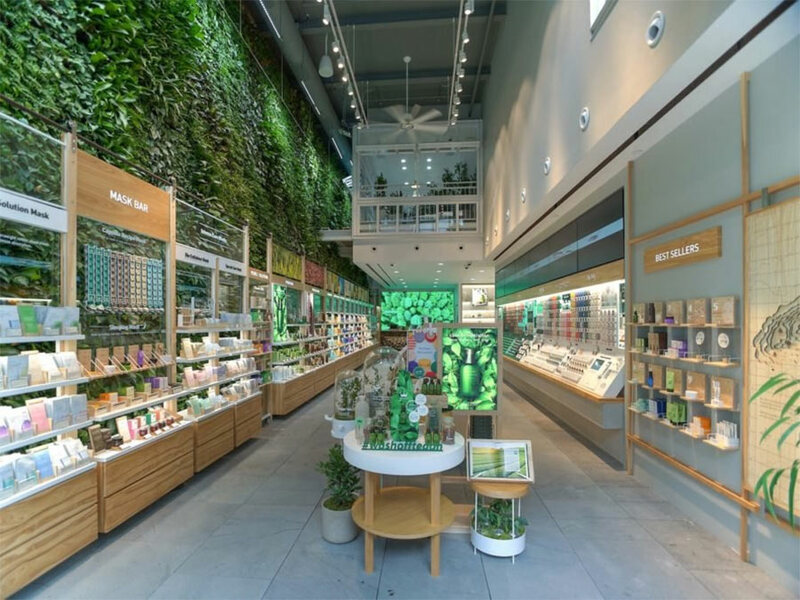 As we have seen, the application of natural materials like plants and other greenery is an underestimated tool that can have a profound effect on a retail space’s ability to deliver an exceptional customer experience. The choice of these kind of materials used within retail spaces should not be limited to traditional living or faux house plants. 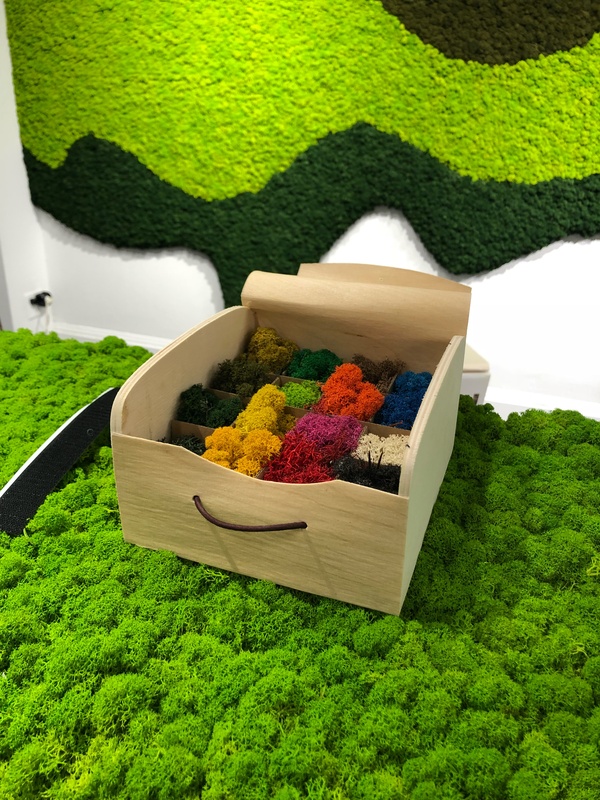 Take a look at Polarmoss, a company that Benchmarc’s design team had the opportunity of coming across during our time at NeoCon 2018 in downtown Chicago this summer. Polarmoss is a reindeer moss and authentic natural material that is used in various decorative ways both within indoor and outdoor spaces. The raw material is available in different product qualities of dried natural moss, and the colored and preserved loose moss product is available in different colors.